On DVD and, its still a classic. A charming smartass (Bill Murray's younger brother John Murray), a spacey rocket scientist (Jennifer Tilly of Seed Of Chucky), a nebbish puppeteer (Brian Backer of Fast Times At Ridgemont High), a terminal hypochondriac (Wendie Jo Sperber of Bosom Buddies), an auto 'doctor' (Fred Williard of A Mighty Wind), a blind old lady, a creepy gorehound and more, all have their licenses suspended and all sentenced to traffic school. But when a vengeful traffic cop (James Keach) and a crooked judge (Sally Kellerman) plot to sell everyone's impounded cars, the class hits the gas with their own plan for high-speed payback on a road full of Moving Violations! When Michael Jackson burned his hair off did he quit? He called up his brothers and started a victory tour. Possibly one of the best movies, I own it on DVD too. Wow I didn't know this one was available. I loved it and need to be looking for it to add to my collection. "I hit a casket with a puppetstage, what am I doing here?" OMG! I have this on my wish list over at Deep Discount DV. I loved this movie. And I loved the theme song. 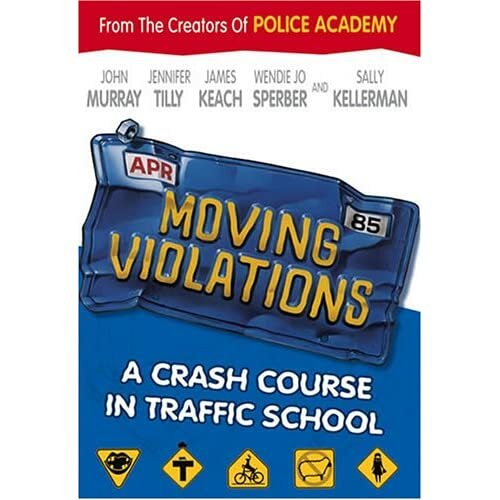 Just bought and watched Moving Violations. I´ve seen this before in the 80s and it is still funny. Jennifer Tilly was very cute. I love when James Keach chases John Murray into the bathroom and pulls him out by the legs under the stall. I hope for his sake he got the right guy? Also, look out for Don Cheadle working the drive-thru near the end of the movie. Blood Flows Red On The Highway! Woohoo, Didnt even know this was avalible on DVD. Ok its region 1, But Im sure I can work around that. Just ordered off Amazon, Damned expensive for a dvd 24 quid, But It will be worth it. My vhs player has just broke, and Ive no way of watching my copy at mo. "Go check out that rear end." Drain out all the water, take in plenty of oil, grease up that back end, get out on the highway and go at full speed for about ten miles. See how it feels. No one has ever mentioned this to me before!!! This is one where I find myself saying "I saw that. Didnt I? Or maybe no???" Im starting to think I DIDNT see it. Hmmmm....gonna have to rent it. This was one of the movies HBO introduced to me long ago - hopefully I'm not letting my nostalgia cloud my judgment but I still like it today! Well worth the $3 I bought it for from deepdiscount a year or two ago (during one of those buy one get one sales on $6 movies). The car lift scene taken in context with the previous scenes is very funny. It's the very fact that nobody with "common sense" would do this, that makes it funny. WHO LIKE WENDIE JO SPERBER?? ?